This conference was one of my most memorable. Jolene Jaquays did an incredible job organizing this year. Everywhere I turned I heard people remarking on her attention to detail and the way things came together. The theme, The Changing Faces of Diversity, was so timely and challenging. I was happy to see how so many in our membership were able to think critically about our field through this lens. Diane Larsen-Freeman was the keynote speaker and her talk was fabulous. She planned her presentation especially for our conference theme and collected evidence for diversity as it benefits those within an organization (or complex system). As expected, she spoke well and captivated the audience, but what struck me most was how personable and kind she was throughout the reset of the conference. Diane attended all of the sessions. She was even present during mine! My presentation was on a topic I have long hoped to discuss at a TESOL conference: feminist pedagogy. I started my academic career with a women’s studies focus, so the move to teaching English language learners felt like a step away from that path. I assumed that in TESOL I would have to depoliticize my teaching and that I would never be able to tie together all of my teaching and research interests. Fortunately, I was quite wrong. I hope to see you at TESOL 2017 where I will be speaking on the IC/ITA/ILGBT Intersection panel about radical acceptance. Our panel title is How to Manage, Facilitate, and Teach about Culturally Sensitive Issues. 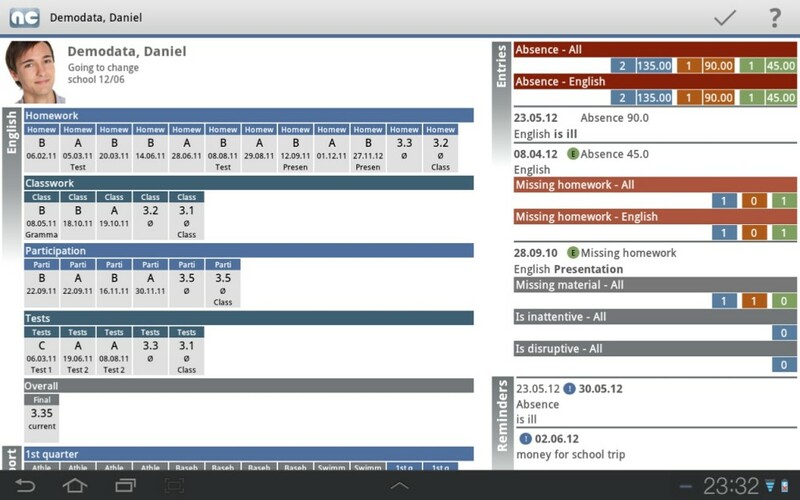 Since my last blog post I’ve found an app with which I can manage my class completely. I take attendance, record grades, assign groups using a random student generator, and make notes about class period goals all in one easy to navigate app called AndroClass. It’s available in a tablet app for $9.99 and a tablet compatible phone app for $5. The catch? The set up takes some time, patience, and willingness to play around with the interface. I was up to the challenge one afternoon and set the whole thing up in just a few hours. As long as you follow the well-explained format, you can import an entire class from a .csv file. 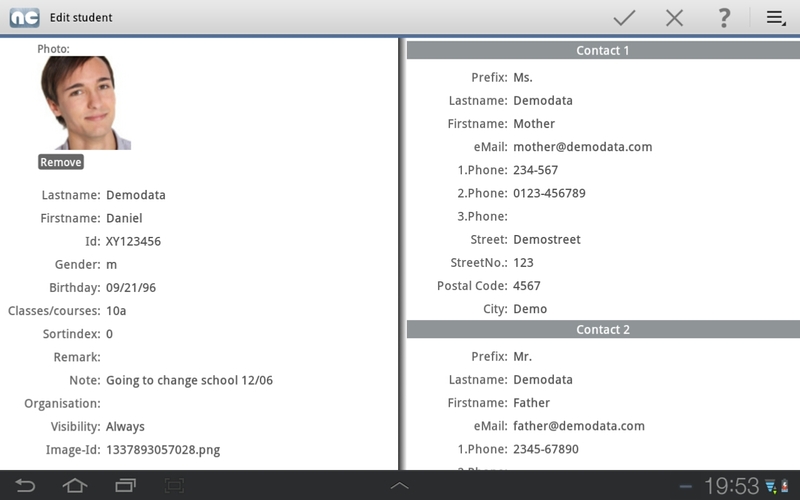 You can include the students’ ID numbers, birthdays, special needs, etc. all at once. This is a major plus. Manually entering each student would be exhausting, but I simply downloaded a .csv file from my university’s course management website, made some adjustments to fit the program’s requirements, and voila! I had my class ready to go. The very best thing about this app is its developer. German developer Andreas Schilling and I have exchanged quite a few emails with my ill-informed questions. He responds very quickly with thorough and helpful answers. For a developer who has to answer questions in multiple languages from frantic instructors worldwide, I am very impressed. This is top-rate customer service. As a graduate student, I don’ t have the luxury of buying extra programs on a whim, especially if I might find that they don’t serve my purposes. The multitude of free, high-quality apps to choose from in the Google Play store makes owning an Android tablet a dream for me. I will say that I usually download 3-6 apps that all do essentially the same thing, try them each out, and then uninstall the ones that were not up to par. This application has been a game changer for me. My students submit all of their papers electronically into the cloud. From there I download their file onto my computer at home and then provide feedback through margin comments. Until recently, I was unable to do this on my tablet because it doesn’t support Microsoft Word. I tried Splashtop Streamer 2 as a remote desktop to solve this issue (see below) but this is an even easier to use and smoother option. 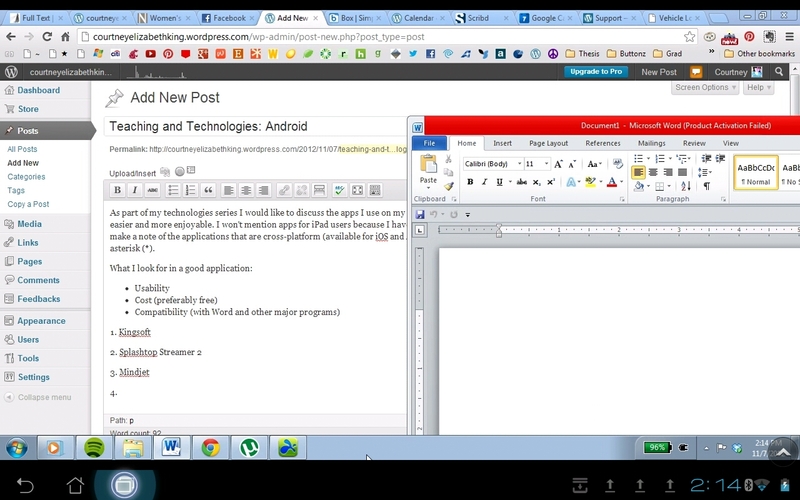 Splashtop Streamer is a remote desktop app. It allows me to access my home computer from my tablet on any wireless connection! This features costs around $10/year but if you primarily use your tablet and computer in the same place/same wireless connection you can use the free version. 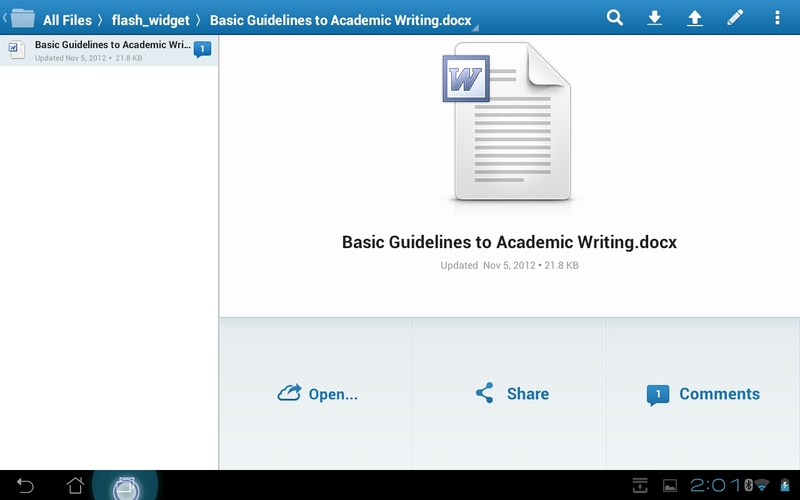 Android users will delight to see this: Microsoft Word! This app works with Box.com and is fantastic for brainstorming. 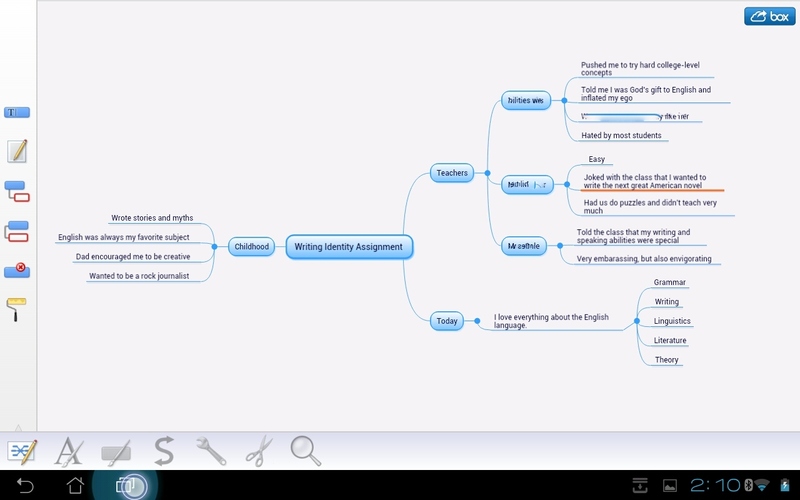 Have students create a mind map for their projects as an assignment directly in the Box.com interface, and upload it from there! It’s even easier than pen and paper! A nifty app to keep your Box.com files easily accessible. Do you feel slighted because I forgot your pet app? Please, share them in the comments! I’ve spent the last few days focusing on online resources for teaching ENGL 101. My course this semester uses Colorado State’s Writing Studio for their course management site and although I like many of the features of this website (including their fantastic guides) I feel like I could be doing more with technology to make my class accessible, engaging, and multimodal. 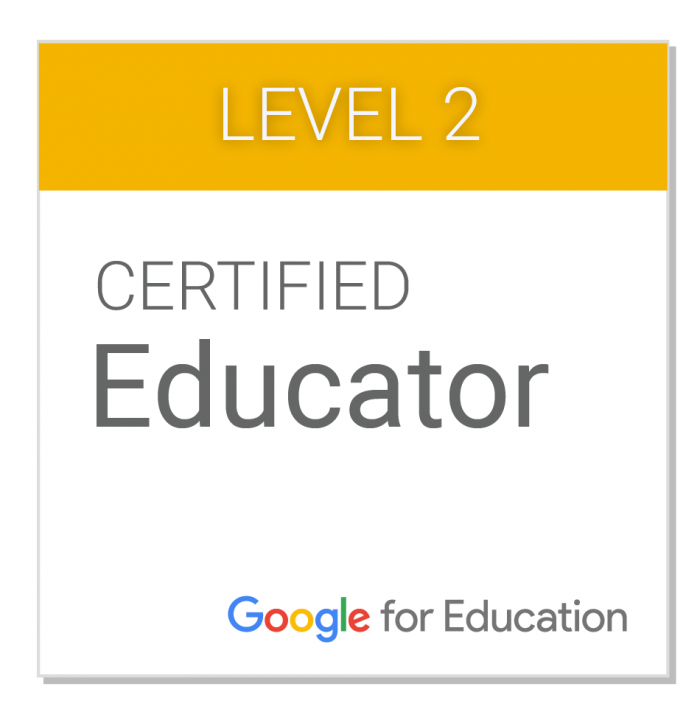 Some of my colleagues use WordPress as their course website and because I have years of experience with WordPress, I figured I might give it a try. Available in the widgets menu, this tool allows you to display a countdown to an important date or deadline (mine is the due date of their first assignment) in the side column of your blog. This can offer a little visual reminder of how much time they have to work on their papers before the due date without me verbally nagging them every day. I explored Box because it too has been added as a standard WordPress widget. Because I know that WordPress is selective in which widgets they add, I decided to check this service out. Much to my delight, I found that Box offers many of the features we’re used to with Dropbox, but with 5 GB of free storage and tons of apps to make the service more usable. 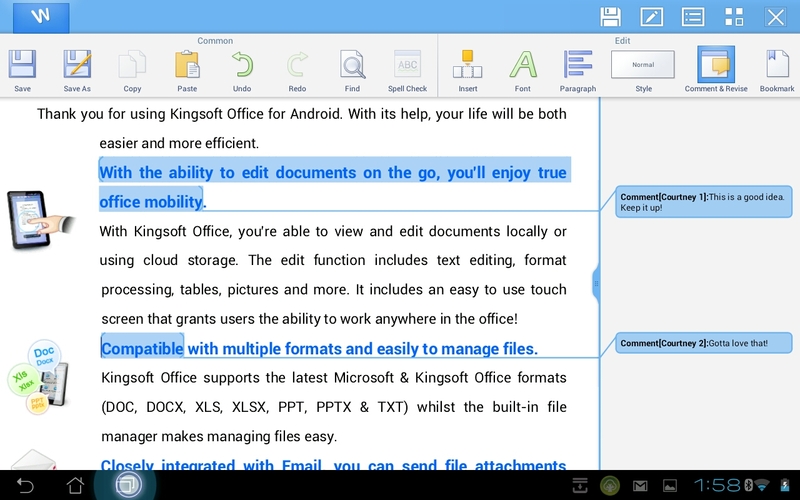 These apps include not only the standard Windows/Mac/Android/iOS applications, but also multiple apps to allow you to annotate PDFs, apps that allow you to print directly from Box, and above all, InstallFree Nexus. This app works in the Box platform and allows any user with a web browser to utilize the full capabilities of Microsoft Word . . . for free! This is a game changer for teachers who often run into the issue of students not owning a copy of Word and therefore finding it hard to get to a computer lab to write. Now they can read our comments and even compose directly from this web-based app! Above all, WordPress had the insight to add it as a widget where students can directly access files or click on the Box link to upload their assignments to a class folder. Scribd is a fantastic service that allows you upload files and then integrate them into your website or blog. If you click on my CV link, you will find that Scribd is hosting my CV and allowing this aesthetically pleasing alternative to download links right on WordPress. After you upload a file, you simply choose how you want to embed it, in this case you select “WordPress” and they provide you with a WordPress-ready code. Voila! I’ve long been a fan of Google Calendar (and all Google services) but only recently tried implementing it into a blog. This is another simple process in which you locate the embed link on your Google Calendar page, copy and paste it into the page you choose, and WordPress does the rest for you. I plan to keep a Google Calendar updated with all of the assignment deadlines for my upcoming ENGL 101 course. These are just the few that excited me. If you have others, please share in the comments section!